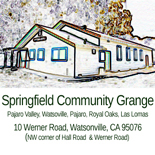 When we first started recruiting members and energy for the revitalization of the Springfield Community Grange, long-time Pajaro Valley resident and activist Cecile Susie Mills jumped right in. The group elected her as secretary, and her intelligence and energy immediately inspired. Shortly after taking this post, Cecile found out she had stage 4 throat cancer and resigned to take care of her health. Cancer did not stop Cecile from inspiring the membership and fostering a wealth of activity. She came, bundled in blankets and weakened by radiation therapy, to our first pancake breakfast in February 2012. There, we composted and utilized as many local and organic ingredients as possible. We washed dishes and used re-useable forks, knives, and spoons. We had fresh flowers and table cloths. The kitchen was abuzz with new vitality after a long dormancy, as was this newly emerging hub of our community. Paper and crayons allowed kids to release creative energies while they ate. No one was turned away for lack of funds, and our pricing allowed for everyone to partake in pancakes and friendship. These simple details and more are all inspired in many ways by Cecile. Cecile also made an appearance at our second pancake breakfast on Mothers’ Day Weekend 2012. Two days later, she passed away. That gesture and last burst of energy made an everlasting impression; her desire to participate in community building never ending. Her spirit lives on in the kitchen, which we’ve named in her honor. The Celebration of Life on July 20th, 2012 brought folks from all over the region to the Springfield Grange. Some knew Cecile in her younger years as a teacher, union organizer, and beach goer. The entire staff and many volunteers from Loaves and Fishes, our local food pantry in Watsonville, came and delivered words of love and appreciation for Cecile and her twelve years of service. Environmental activists reflected on their time organizing with Farm Not Harm and the battle against toxic fumigants onto school grounds. Several members of the Santa Cruz and Pajaro Valley chapters of the Women’s International League for Peace and Freedom (WILPF) came and shared their stories of Cecile’s wisdom and brilliance in the movement. Thanks for the beautiful and heartfelt memorial for Cecile. She was lucky to have so many wonderful friends! A very fitting tribute for a lifetime of activism. Cecile’s work and spirit lives on. This entry was posted on July 21, 2012 by dveraisaxton in Announcements and tagged Cecile Mills, Farm WIthout Harm, Pajaro Valley Loaves and Fishes, Springfield Community Grange, WILPF.